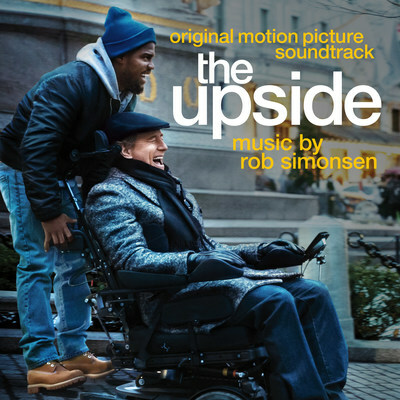 NEW YORK, Jan. 18, 2019 /PRNewswire/ -- Sony Music announces the release of THE UPSIDE (ORIGINAL MOTION PICTURE SOUNDTRACK) with music by renowned film composer and newly-signed Sony Music Masterworks artist Rob Simonsen (The Front Runner, Foxcatcher, 500 Days of Summer). Available January 18, the soundtrack features music from the Kevin Hart and Bryan Cranston-starring film from STXfilms, in theaters nationwide January 11. Of the soundtrack, composer Rob Simonsen says: "It was an honor to work with Neil Burger and his extremely creative team on the score for The Upside - finding just the right balance of emotion and levity in the score." Based on French film The Intouchables, The Upside is director Neil Burger's heartfelt comedy about a recently paroled ex-convict (Kevin Hart) who strikes up an unlikely friendship with a paralyzed billionaire (Bryan Cranston). The film also stars Nicole Kidman, Julianna Margulies and Aja Naomi King. Having learned to play the piano at a young age and with an educational background in jazz, electronic and traditional orchestral music, Sony Music Masterworks artist ROB SIMONSEN has lent his scoring talents to a wide range of film projects. Since the early 2000s, he's worked on an expansive list of film soundtracks, among them The Front Runner, Love, Simon, Nerve, Foxcatcher, The Way, Way Back and The Spectacular Now. Under the apprenticeship of composer Mychael Danna, Simonsen worked on films like 500 Days Of Summer and Moneyball, in addition to collaborating with Danna on his Academy Award-winning score for Ang Lee's Life Of Pi. In addition to his lengthy catalogue of film scores, Simonsen is the founder of The Echo Society, a Los Angeles-based non-profit artist collective. Surrounding himself with a network of like-minded artists, Simonsen founded The Echo Society in order to connect, inspire, challenge and enrich the creative community in Los Angeles by sponsoring live, professional sonic/visual performances and offering immersive and interactive audience experiences. Inspired by a lifetime of making music and emboldened by his work with The Echo Society, Rob Simonsen will step out from behind the screen for the release of his solo debut with Sony Music Masterworks in 2019.